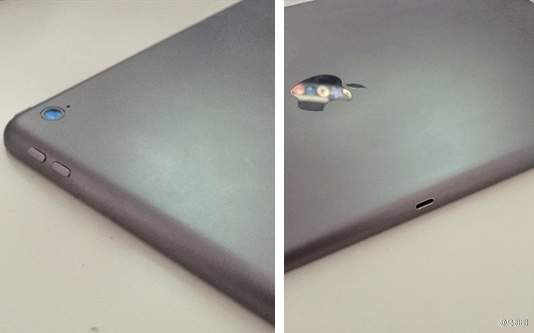 Images of what appear to be a mockup version of the upcoming larger-screened "iPad Pro" depict either a secondary Lightning port or a USB-C port on one side of the device, suggesting it could potentially have multiple methods of charging and/or the ability to support accessories like keyboards and mice. The pictures, which show the mystery port, a headphone jack/speakers, and the camera, originated on microblogging site Sina Weibo and were shared by Italian site HDBlog. Case manufacturers and other accessory makers often create dummy models of upcoming Apple devices to get an early start on the development process, and the tablet pictured in the photos is likely one of these mockups. Most of these models are based on rumors and leaked schematics, and while they're frequently accurate, there have been errors in dummy models for past devices. 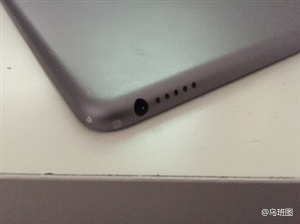 The port on the left side of the device in the images does line up with a previously leaked iPad Pro case that had an opening on the left side believed to be for a SIM card tray, but the presence of a side port was not seen in schematics shared by Japanese magazine Mac Fan last November. Those schematics may have been inaccurate or out of date, as rumors have suggested Apple is still working on ironing out the tablet's features ahead of its release. Given the design similarities between a Lightning port and a USB-C port, it is not entirely clear what function the extra port serves, but a recent rumor from The Wall Street Journal pointed towards the the possible inclusion of USB 3.0 ports on the iPad Pro, potentially allowing the device to connect to a keyboard or mouse. Aside from the Lightning port, the other images shared on Weibo show a rear camera with light sensor and microphone, and a headphone jack adjacent to a row of speakers. Rumors have suggested the iPad Pro will have speakers and microphones at the top and bottom edges of the device for a stereo audio experience. Aside from its larger size and tweaked design elements to accommodate new features, the iPad Pro is said to look similar to the existing iPad Air and iPad mini. It's rumored to have a high-resolution display between 12.2 and 12.9 inches, an A8X processor, 2GB RAM, and Touch ID. It may also support an optional stylus accessory. Apple may be targeting a September 2015 production timeline for the tablet, so it may come alongside new iPad Air and iPad mini models this fall. Update: We've received word that these images were originally shared by Dutch site vandaagapple.nl [Google Translate] in February. Never thought I'd see an iPad with more ports than a MacBook. Thanks for that insightful and erudite analysis, I'm sure everyone was waiting to see which way *your* wind blew before deciding for themselves whether this is useful or not. I really dislike that one macbook supports USB C, others support Thunderbolt and the Ipad has lightning. I really wish Apple would pick one and get all products over. I had thought when it came out with Thunderbolt that it would standardize on that, but then it came out with lightning. And now I potentially have to carry multiple cables. Stop the madness. ONE STANDARD and ONE CABLE FOR ALL. Okay sorry I screamed but this is just sill of Apple. I can't imagine this would really be intended for keyboards/mice. Apple is obsessed with wireless input devices, even on full desktop machines. A second lightning port for landscape orientation docking in a desk dock? iPad Pro could be good for photography or graphic designers with best Wacom you can buy. I'm tired of carry my Wacom equipments and cords. Only if it has an amazing display and can't see any pixels is all I care, not numbers. For me: No real osx=No buy! Says the non artist or designer, which it could be the best product ever.